North Cyprus offers many wonderful places to see on you holiday. We offer you list of TOP places to visit in North Cyprus you should not miss. 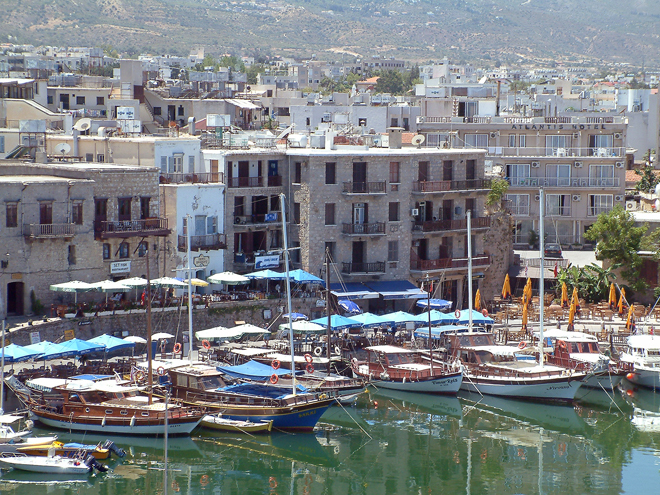 The pitaresque old harbour is one of the best places to visit in North Cyprus. The harbouris lined by flats, cafes, bars and restaurants offering lots of good places to eat where you can taste the local food. 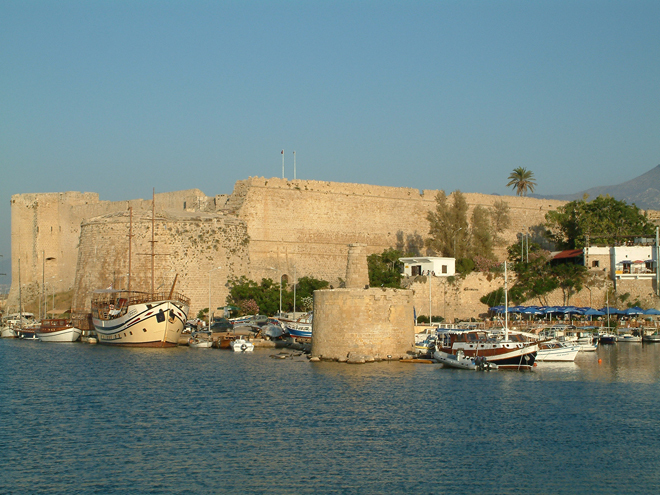 Situated next to the Kyrenia Harbour, the Kyrenia Castle is a complicated mixture of building styles worth visiting in North Cyprus. Behind the venetian castle walls you will find chruch of St George, royal apartments, byzantie chappel or French dungeons. The ship in the Shipwreck museum is estimated to have sunk around 300BC and is, to date, the oldest ship ever to be recoverd from the seabed. Turtle beach is a long stetch beach of sand. The beach is signposted as it is here where the green and loggerhead turtles come and lay their egges in the summer. 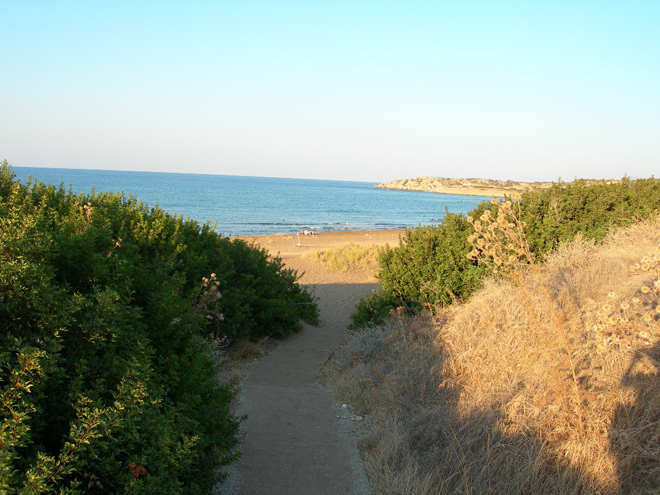 The beach is mostly visited by local Cypriots. Visit North Cyprus Turtle Beach if you want to experience local atmosphere. 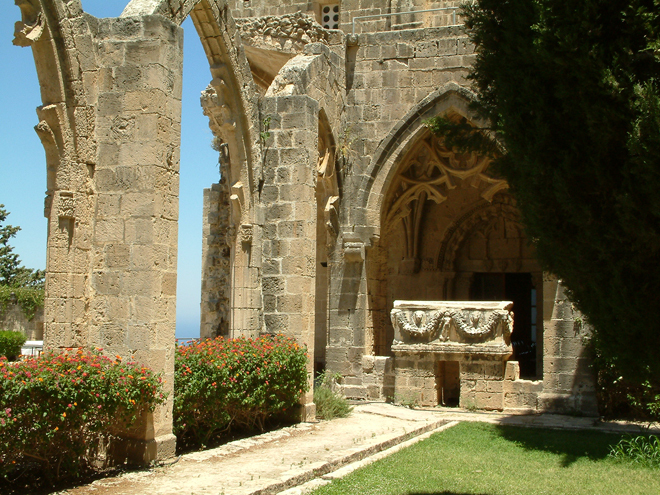 The Bellapais Abbey is truelly one of the most trenquil places in North Cyprus. It was founded at the beginning of the thirteen century. Most of the Bellapais Abbey that is visible today dates from the time of Hugh III. It is beautiful and elegant building depicting Gothic styles throughout the stage of its develpment. A small courtyard is defended by a machiocated gatehoue. 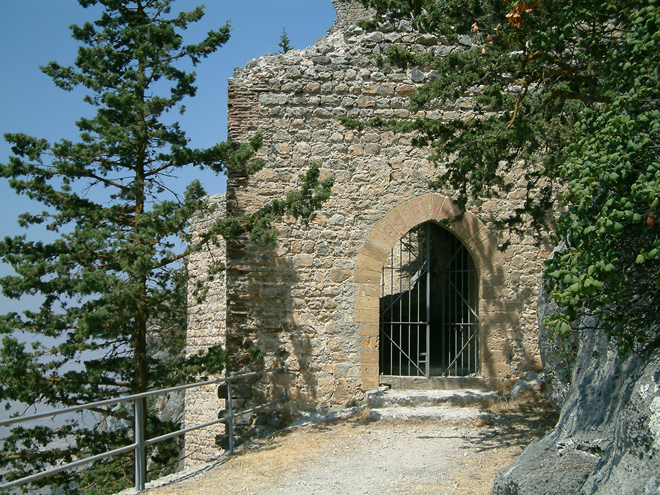 St Hilarion Castle is another best place to visit in North Cyprus. 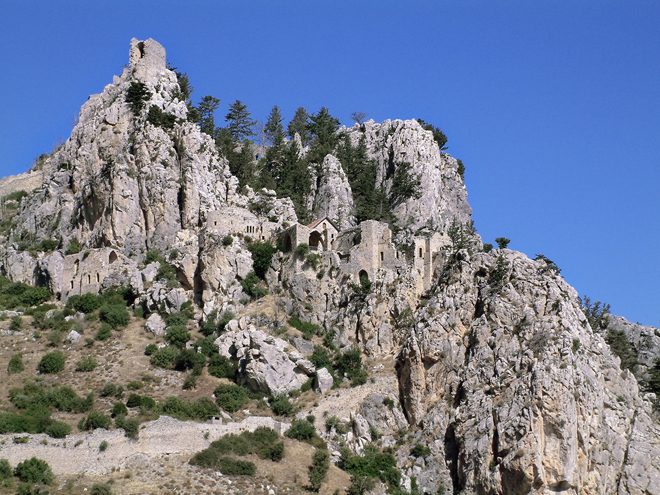 The castle stands just about Kyrenia in 670 m. It was named by a hermit who once inhabited the summit. The castle was built on three levels. The upper level consists of winding and very anrrow steps up to Prince John's Tower and royal apartments. It offers splendid view over Kyrenia and surrounding villages. Buffavento Castle lies about 16 km eastwards from Kyrenia, North Cyprus. Situated in 954 m it is the highest castle offering the most spectacular view. 6.8 km drive along a rough track is follwoed by a 45 minute walk up the mountain path. 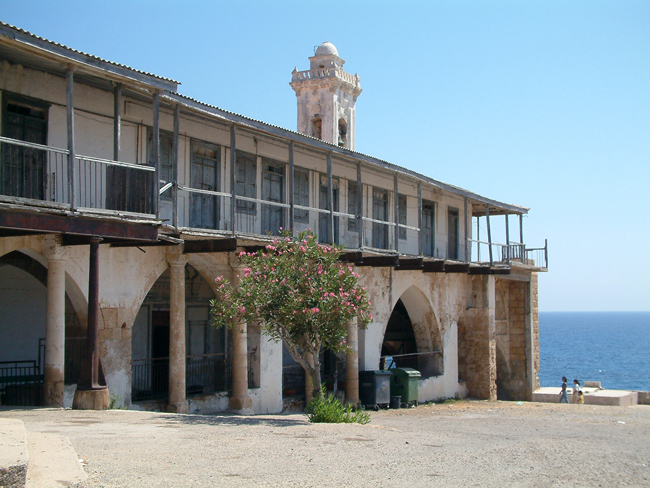 Largely ruined, it is an impressive architecture you should not miss when visiting North Cyprus..
Karpaz peninsula situated in the nort-east part of North Cyprus is a land where time stands still with miles and miles of untouched sandy beaches. Situated at the tip of the peninsula, Apostolos Andreas Monastery is dedicated to St Andrew, the miracle worker. Karpaz is also know for its wildlife including wild donkeys. Visit Karpaz as one of the most beautiful place in North Cyprus. 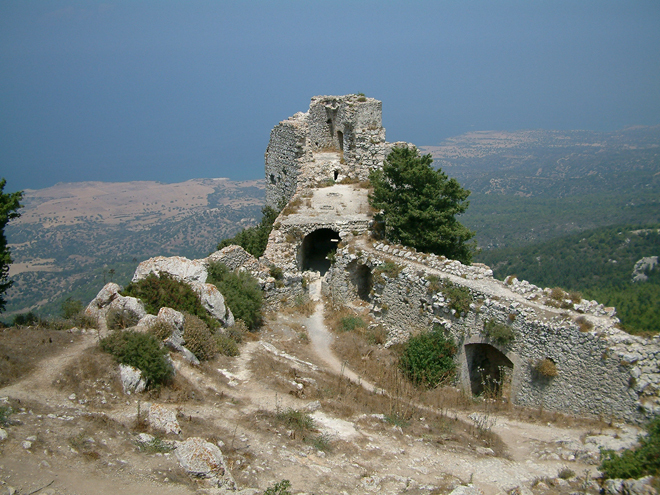 Kantara Castle was build by the Byzantines in 965 to rule the Karpaz peninsula after the Arabs raids. It stands at 610 m and is the most accessible. It was constructed around the entire circumstance of the mountain peak on which it was built. On clear days it offers splendid view on the Karpaz peninsula and Salamis Bay to Famagusta and other part of North Cyprus. 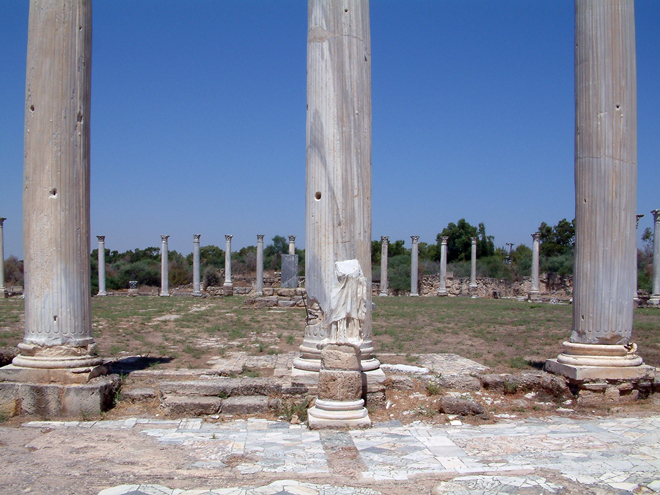 Situated on the east coast, Salamis is one of the most important and fascinating sites in North Cyprus. It was founded around the 12th Century BC and had a long development until its destruction by Arab raiders, earthquake and tides in the 7th Century. It is a large city comples revealing Roman buildings and architecture. 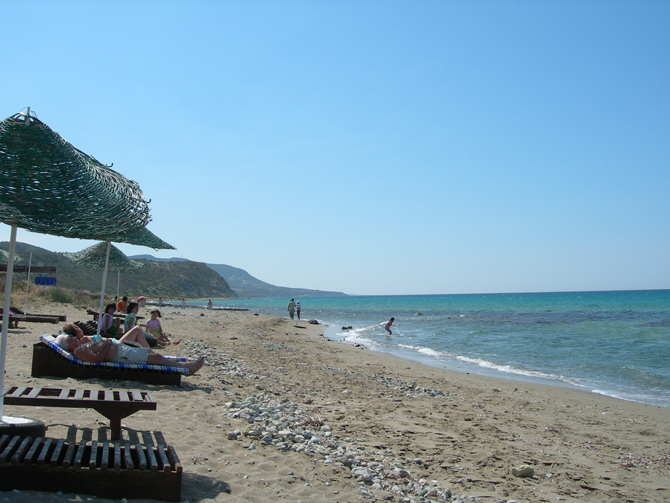 Glapsides beach is a a popular sandy beach with beach bars in North Cyprus. 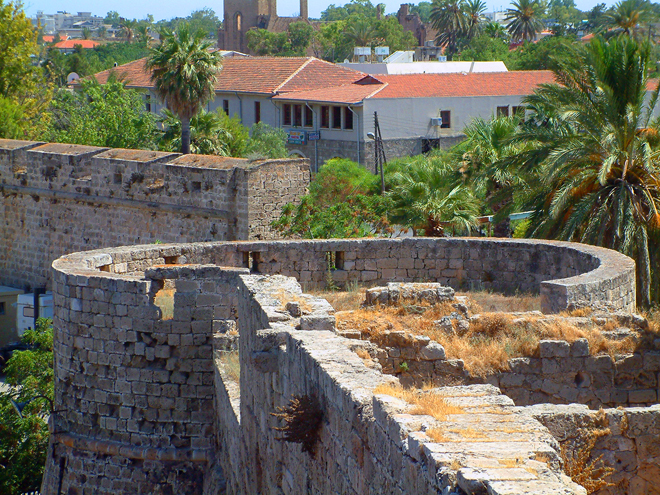 Famagusta city-walls built by the Lusignans and were originally high and thin. The Venetians fortified the walls against artillery fire particularly to protect themselves from the Ottomans. Martinengo Bastion is considered the to be one of the finest examples of military architecture of the 16the Century in North Cyprus. St Barnabas Monastery dates back to 1756 and the white domes are the local landmarks. It was named after St Barnabas, the Apostole. 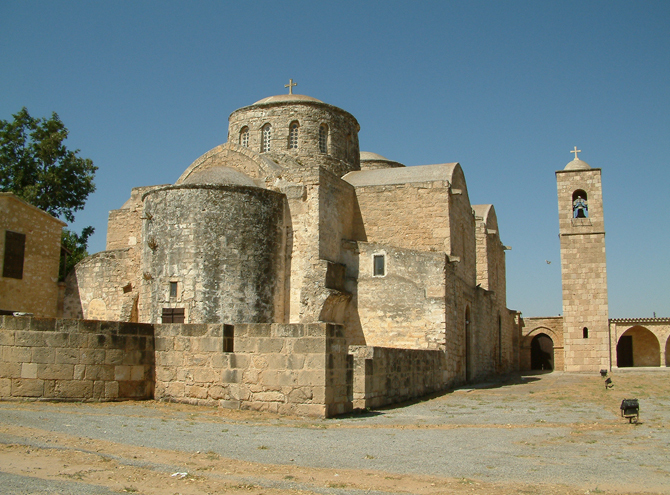 The tomb of St Barnabas is still a place of pilgrimage for Greek Cypriots who live in North Cyprus. St Nicolas' Cathedral is the most impressive monument in Famagusta. 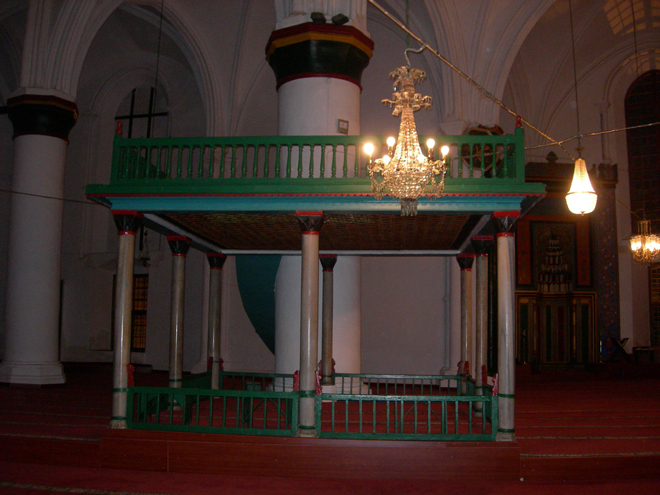 Lusignan kings were crowned here in absentia as kings of Jerusalem after they had been crowned as kings of Cyprus in Nicosia. The cathedral was turned into a mosque by the Ottomans and names after Ottoman General who conquered Cyprus. 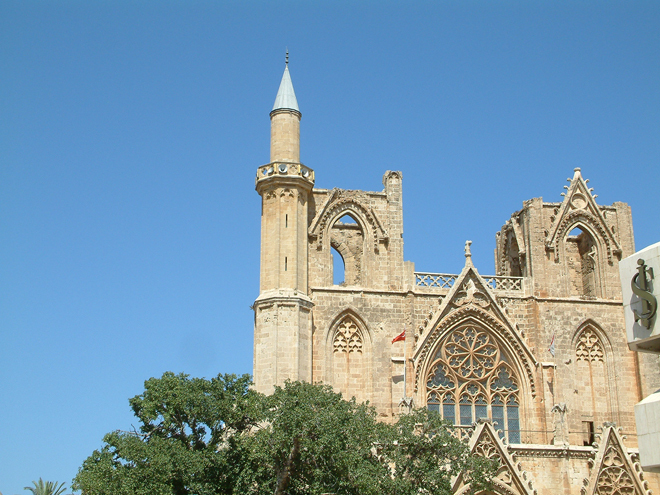 The Cathedral is one of the most impressive Gothic works of architecture in North Cyprus. Founded in 1209 with long construction until 1326. In St Sophia Cathedral kings of Cyprus were crowned. In Ottoman period the cathedral was conveted into a mosque to symoblize the power of the muslim faith. All Christian features were stripped except of some tombstones. 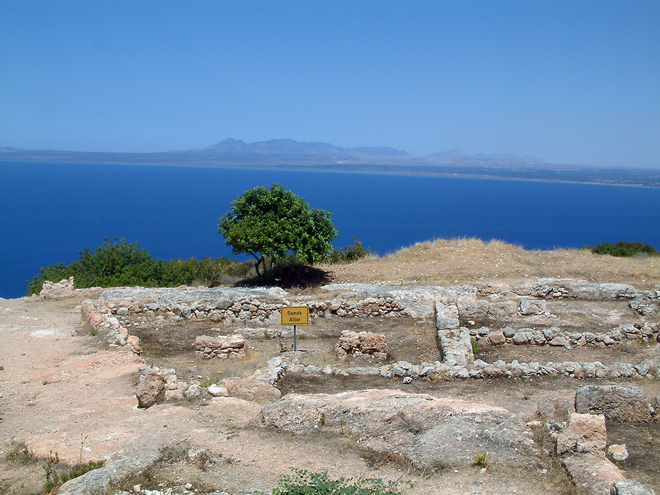 One of the Ten City Kingdoms that made up the island at that time, Soli was probably founded around 6th Century BC. The ruins that can be seen today were originally built by the Romans. You can find a theater, remains of 5th Century basilica, mosaics and a base of the fountain once dedicated to Goddess Aphrodite. In southern aisle there are fascinating geometric patterns or churdh.